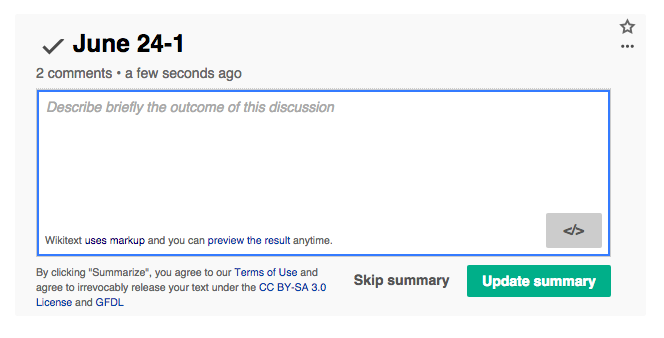 The summarise field on Flow should have a placeholder: "Describe briefly the outcome of this discussion". Pginer-WMF added projects: VisualEditor-ContentEditable, VisualEditor, StructuredDiscussions, Collaboration-Team-Triage. Pginer-WMF removed a parent task: T96593: Be able to set placeholder text (generic content?) on an empty CE surface. Pginer-WMF added a subtask: T96593: Be able to set placeholder text (generic content?) on an empty CE surface. Pginer-WMF added subscribers: Jdforrester-WMF, Aklapper, DannyH, Pginer-WMF. Catrope added a project: Collaboration-Team-Sprint-D-2015-06-30. Catrope moved this task from Sprint D - ends July 1 to Needs Review on the Collaboration-Team-Sprint-D-2015-06-30 board. Checked on beta.wmflabs.org in FF, Chrome, and Safari.